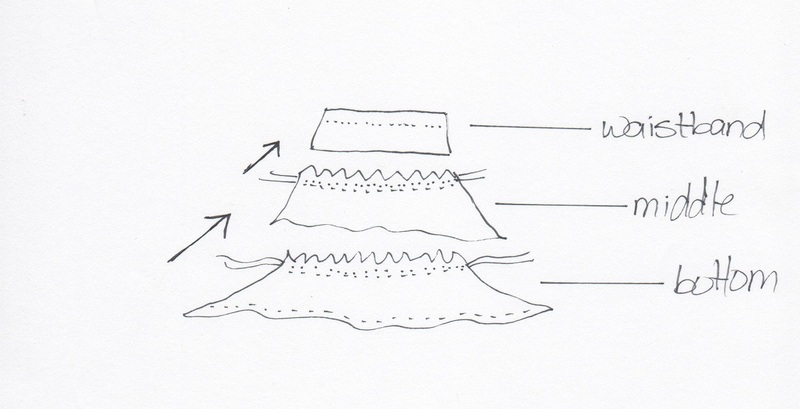 Tiered skirts are made by stacking three (or more) panels of fabric. Each panel is 1.5 times wider than the one above it. 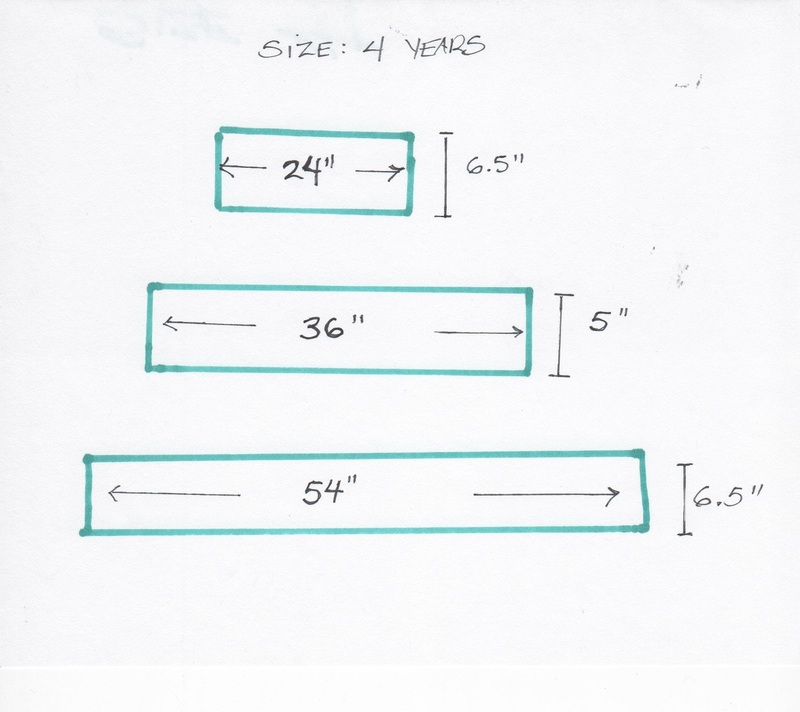 They are all approximately the same height, but an extra 1.5 inches has been added to the waistband (to allow you to fold over a waistband casing) and at the hem (allows for a 1.5 inch hem). 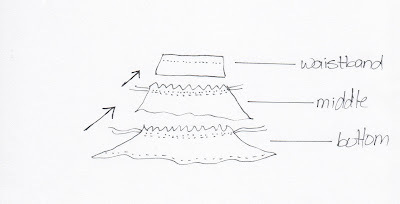 Fold each length of fabric in half and sew one short end closed to form a ring for each tier of the skirt. Each tier's top edge is gathered to be roughly the same width as the bottom of the tier above it. Starting with the bottom tier, attach each tier to the bottom of the tier above it. Fold over the top to form a casing for a waistband. Thread through an elastic that is your child's waist measurement plus one inch. Hem the bottom. Zigzag or serge any raw edges inside. Enjoy. I have always wanted to make one of these for my little Claire! I need more simple ones like this! Thanks so much! I love making these skirts, but I cheat a little. I hate gathering fabric by hand so I use a ruffler that is set to pleat exactly the right amount! 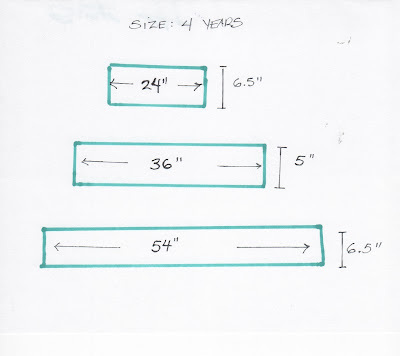 Thanks for the measurements for size 4! Thanks for sharing this tutorial. I always seem to have random pieces of fabric laying around. This skirt is a perfect way to use them. My daughter will love this! I have saved this into my favorites for a few weeks now working up the courage to do this...well tonight I did it! I love it!! I had to adjust for size, I have a tall almost 6 year old, so I did 4 tiers and my measurements were 27.5 for tier one, 39.5 for teir 2, 54 for 3 and 75.5 for 4th tier, approximately, I also learned that lightweight fabric ruffles ALOT easier. Awesome tutorial, thank you for sharing, I did mine in red/white/blue/ motif!! Çok güzel.Teşekkür ederim bu yazınız için.Çok işime yarayacak.